The Committee Europe is based on the idea of bringing together students of all kind of schools from as many as possible European countries for a mutual cultural exchange, to eliminate prejudices and to stabilise the idea of one European citizenship. This is carried out in common work, following given topics and personal meeting of students and teachers during school events of sports, music, linguistic, cultural and/or scientific themes. A special objective is the integration of disabled children in all sorts of work. View more presentations from Hèctor-Xavier Salvo. For such meetings, the several member schools invite to a fixed organised scope after their possibilities for a period of three to four days. For the guests there is a free housing and catering in families of the host school. Every autumn the representatives of all member schools meet at a confe rence. Topics and working methods as well as basic organising shapes of the common work will be fixed there. The Committee Europe is represented by a board with a president, a vice-president and a secretary-general. The vice-president should be a member of the school that will carry out the next meeting. All offices are elected each year during the conference in autumn. The management helps to plan, to coordinate and to publish the several intended works of the member schools. To finance the events the organising school is responsible. The management of the Committee Europe helps and gives advice. The Committee Europe has been established at 12.01.1991 in Den Haag/ Netherlands. The year before, in May 1990, a very successful meeting with 710 participants took place in Briec de L'Odet, in Brittany / France. It was initialised by J. L. Paugam, the director of the host school at that time. 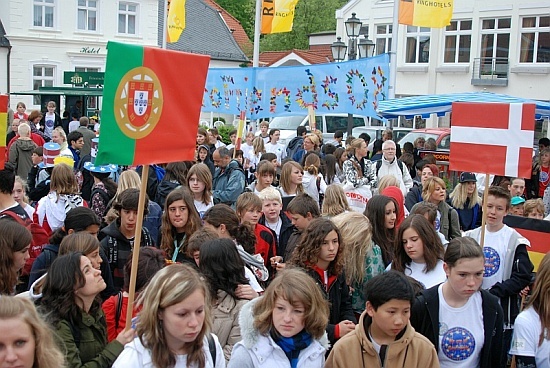 The Alexander-von-Humboldt-Schule represented the German colours as a partner school. Because all participants had experienced very positive results of this event of European students, they decided to create possibilities to repeat such an event for interested students and teachers. Today there are 10 Schools out of 6 European countries members of the Committee Europe who take regularly part in the yearly meetings. Other schools have, up to now, sporadicly taken part, because it's sometimes not easy for them, to raise the needed travel expenses. The Committee Europe cares for educating students to become European Citizens. This is supported by the German minister of Culture Conferenceand the minister of Culture of the Federal States. The schools which are connected to the Committee Europe understand their efforts as a chance for communication and integration as a necessary duty of each school to corporate and to bring in an important contribution for the understanding of each other. The current organisational objective is to realise a yearly meeting to discuss the planned topics and arrangements for a period of about 5 years, to give enough time to the member schools, to decide an own participation. You find informations about the Memberschools and the events EuroFriends 2008, EuroRevue 2009, EuroReporter 2010, EuroHumour 2011 and the last event EuroVikings 2012 on this webpage of Committee Europe www.committee-europe.eu. In 2013 there will be the event EuroPAXket 2013 and we start with a new project EuroWater 2013-2015.